It’s fascinating, educational, and fun to build your own speakers. 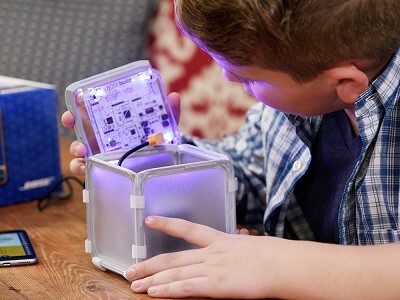 BOSEbuild harnesses kids’ curiosity as they create a full-fledged Bluetooth speaker from the inside out. They start with magnets and coils, then—with the help of an interactive app—assemble a robust, color-changing speaker. Instead of just following a mundane list of instructions, games and experiments guide the way. Discovery becomes a byproduct of play. BOSEbuild’s team of engineers wanted to make seemingly complex technology accessible. Making the speaker gets kids to touch, see, interact with, and understand its inner workings. Plus, the design begs to be taken apart and put back together. Whether kids take the morning and a nook in the house to build on their own, or they share those “aha” moments with a parent or friend—with BOSEbuild, you're the maker. Hello everyone! I'm proud to introduce BOSEbuild to The Grommet. I'd be happy to answer any questions you have! I'm here in Bose R&D headquarters with Lee Zamir (pictured above) the man in charge of BOSEbuild and the inventor of the Speaker Cube. We would to hear any feedback you have about this new product and we're happy to answer any questions. Joe, it appears the circuit board is complete, and most of the building is the parts of the speaker and the box..is that correct? @Joe The photos have younger kids in them...how involved is the building and would it be too basic for a 14 year old that is involved in robotics. @Joe How in depth do the kits get, do the kids learn on how to solder? @Joe; I think this is a fabulous idea! I will have to save up to get it for my teenage son, but will definitely be getting one for him. I know he will get a lot of satisfaction out of building his own speaker! is this an actual "Bose" brand speaker when you are done? @Martha – We find kids of all ages enjoy the activities that accompany the Speaker Cube. Older kids may consider the assembly of the final product ‘basic’ because it doesn’t require soldering or special tools, but they still seem to enjoy the activities that precede it… the learning about how speakers actually work. And everyone loves the lights in the speaker at the end! @Alan – The kids do not do any soldering as part of this experience… by choosing to use the same high-end components that you would find in other Bose products we made it impossible to solder by hand. This way we can also stand by the finished product though with our 2 year limited warranty. @Cecille Thanks for the support and feedback!! @Candice This speaker (when complete) sounds as good as other Bose products because we use the same components (electronics and transducer) and it was even tuned right here at Bose HQ. It was designed (acoustically) to be a great single-room sound system. Ideal for a kids bedroom or playroom area. So the circuit board is done, and not part of the assemble process? I grew up with radio shack circuit board kits...i loved that aspect of building electronics. @Chris - See the answer above about the circuit board, but we totally agree with you. We made the choice to not have kids do the soldering here for a few reasons: 1) We wanted this to be accessible to kids of all skill levels 2) We wanted to be able to stand behind the final product and ensure that it will last for years (ie no cold solder joints :) and 3) We wanted to use the best components in the design (that are impossible to hand solder) to ensure great sound performance and Bluetooth connectivity. Hello! What is the youngest age that would be appropriate for BOSEbuild? @Valerie – We recommend this product for kids 8 and older so that the kids can do it entirely on their own. If a parent sits down with a child and goes through the app and the whole experience, then we’ve seen kids as young as 5 really enjoy the whole experience and get a lot out of it. What is the recommended age range for the Speaker Cube assemblers? @ Joseph (great name!) The recommended range for the speaker is 8-14, but see my comment above about younger kids. We also see that older kids (and even those that are just kids at heart) enjoy the product as well. will this be an actual "Bose" speaker when done? It’s fascinating, educational, and fun to build your own speakers. BOSEbuild harnesses kids’ curiosity as they create a full-fledged Bluetooth speaker from the inside out. They start with magnets and coils, then—with the help of an interactive app—assemble a robust, color-changing speaker. Instead of just following a mundane list of instructions, games and experiments guide the way. Discovery becomes a byproduct of play. BOSEbuild’s team of engineers wanted to make seemingly complex technology accessible. Making the speaker gets kids to touch, see, interact with, and understand its inner workings. Plus, the design begs to be taken apart and put back together.